Are y’all as addicted to Pinterest as I am? I could totally just browse for hours, and at the end, I actually kinda feel productive. Unlike just cruising facebook or some other time sucker website, I have something to show for my time wasting – fabulous new ideas for organization, recipes, outfits, decorating, etc. I even know 100 uses for baking soda! Granted I will probably use only 1% of these, but who cares, the other 99% are there just in case. Like the recipe pin I found for pink lemonade pound cake. It ended up the actual recipe sounded not-so-fabulous, but as fate had it, Deb had just posted a recipe for these pink lemonade bars. It was meant to be. 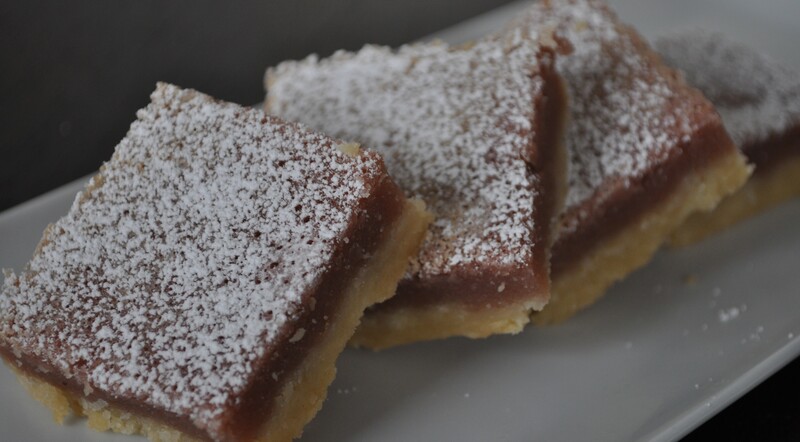 These are like your typical lemon bar, but with a slight berry flavor and this really pretty magenta-like color. When I originally made them I decreased the lemon juice and increased the raspberry, thinking it would make them less tart and therefore, more appealing to my toddler. I wish I hadn’t, as I missed the tart, so I’m posting the original recipe’s proportions below. 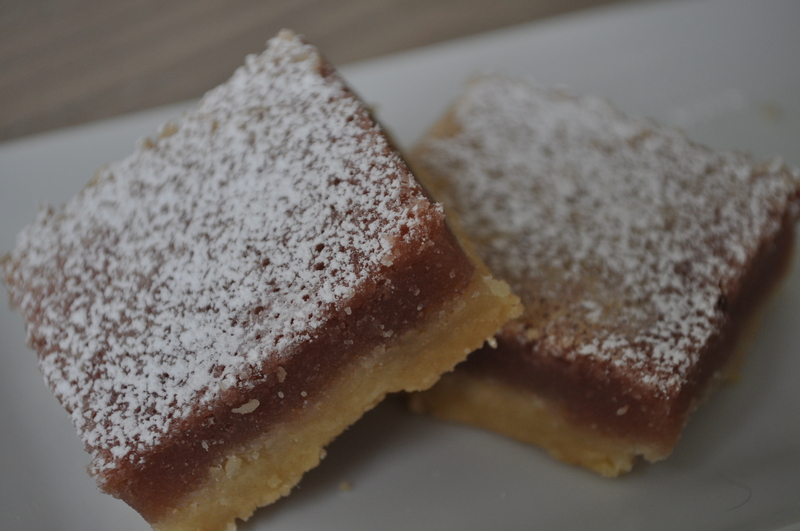 If you like your lemon bars on the gooier side, decrease the flour by a tablespoon. As is, they are delicious, it’s totally just a preference thing. These would be absolutely perfect for a girly party (baby/wedding shower) or any hot summer day when you want something rich but refreshing. They are just too pretty to pass up! Preheat oven to 350°F and coat a 8×8 in . baking pan with nonstick spray (or line with parchment). In food processor pulse together the sugar, zest, and salt. Add butter and pulse until evenly dispersed. Add flour and pulse just until mixture is combined. Bake for 15 minutes, then set out to cool slightly. Rinse out food processor and puree raspberries. Pour puree through a fine-mesh sieve over a bowl (you will need to press with a spatula to get out all the juice). In a bowl, whisk together eggs, sugar, and lemon juice until smooth. Whisk in 3 T of puree, then stir in flour. Pour on top of crust and bake for 25-30 minutes, or until bars barely jiggle and the edges are slightly golden. Cool completely in fridge then cut into squares. Posted in Recipes, Sweets and tagged bar cookie, cookie, pink lemonade. Bookmark the permalink. They looked wonderful. It is hard trying to adjust recipes for very young childern. Thanks for sharing your recipe.